We have managed to make a list of potential issues iOS 8 may present to AppRadio Mode from reading multiple forum posts and comments across the internet. Remember, these issues were experienced by individuals who were trying out early iOS 8 betas (not even the Gold Master release Apple put out yesterday) with their Pioneer AppRadios or NEX receivers. These issues may get fixed by the time iOS 8 is released to the public on September 17. 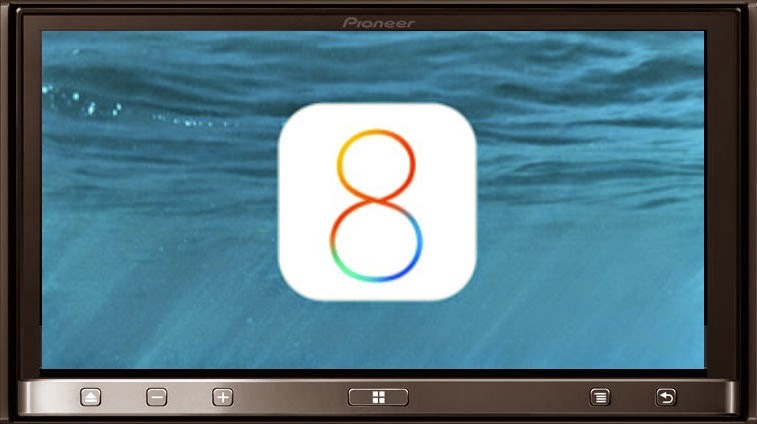 Pioneer has already made a statement saying it can't guarantee AppRadio Mode to be compatible with iOS 8 on its website but that is understandable. Unless the final release of iOS 8 becomes available for testing, those issues may not be identified or fixed. 1. Screen Resizing: Remember the screen resizing issue which got partially fixed in iOS 7 to a flicker? Seems like early iOS 8 betas brought back the issue for a few people. This one will have to be fixed completely. Even the flickering/jerkiness of the screen resolution can get annoying after a while. 2. Keyboard Issues: Apps that use a keyboard, like Car Browser or EC Touch, had crashing issues in iOS 8 beta. These fixes may have to be done by app developers. 3. GPS: Some people have complained about GPS positioning issues in iOS 8 beta. This is more likely an iOS issue which will get fixed in the final release. All issues were reported in the first beta release and haven't been reported since. 4. AppRadio App: The AppRadio app from Pioneer will have to be updated for iOS 8. There have been instances of the app crashing when used on iOS 8 beta. We saw the same issue with iOS 7 beta last year which was fixed when the the final release came out and the app was updated. 5. Third-party App Issues: Just like the AppRadio app, third-party apps that are AppRadio Mode compatible will have to be updated by developers for iOS 8. Issue with these apps crashing or not working at all have been mentioned with iOS 8 beta version testing. Does anyone know if there are issues with the compatibility with iOS 8 in the final release?